I hate the scale. I love the scale. Really it is such a love/hate relationship. On New years eve this year, I "indulged" in a lot of crap and on New Year's Day, I weighed in at 170 lbs. That was only a few pounds over what I'd been maintaining since July of '09 but I didn't want to see that 7 in the middle...so I went back on induction and lost 5 pounds! Then on Monday, February 1st, the scale said 163.5!!! I was soooo excited! Now fast forward 2 days - yes only two. This morning that evil scale said 167! WTF?? 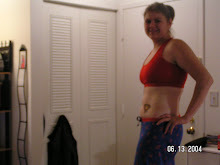 I weighed a few times and yup, I am back up 3.5 pounds. I don't get it. I have NOT overeaten - I haven't had ANY bad carbs that I can think of - except I had 1/4 of an orange monday and yesterday...could <I>that</I> really have done it? So anyways I dunno. I started this morning with eggs, bacon and sausage instead of my yogurt...so we shall see. I know a lot of people say "not to obsess over the scale" and honestly I wish I didn't - but it truly is a necessary evil because when I don't, it goes up. I truly feel your pain. If I weigh daily then usually that number control the whole tone of my day. I try my very best to stay away from the scale because of this but if I do it is far too easy for things to get out of control. I weigh in once a week now.....with the scale out of easy reach the rest of the week!